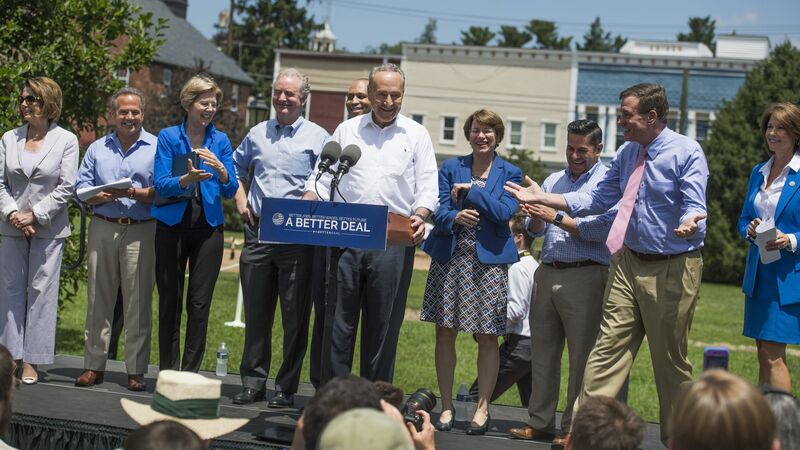 Democrats unveiled a new plank of their "A Better Deal" policy platform today, which largely focuses on corruption under President Trump and campaign finance. Why it matters: "A Better Deal" was introduced last summer and mainly focused on the economy. The addition of corruption reveals what Democrats hope will be a winning message for the party come November. Flashback: Democrats used a similar message in 2006, the Washington Post notes, focusing on pay-to-play politics after a number of controversies involving Republicans. Democrats picked up 31 House seats that year. Tighten federal laws that regulate lobbying disclosures and federal agent registration. Crack down on lawmakers' ability to avoid conviction in situations of pay-to-play and bribery. Improve election infrastructure and protect voting systems from hacking. The details: House Minority Leader Nancy Pelosi and Senate Minority Leader Chuck Schumer led the Democrats during today's unveiling of the new proposals. They were joined by other Democrats, like Sen. Sheldon Whitehouse and Rep. Cheri Bustos. The new proposals were endorsed by 25 Democratic groups. What they're saying: "President Trump has embraced the most egregious establishment Republican norms," Schumer said. "The Swamp has never been more foul or more fetid than under this President."